Adonijah conferred with Joab son of Zeruiah and with Abiathar the priest, and they gave him their support. But Zadok the priest, Benaiah son of Jehoiada, Nathan the prophet, Shimei and Rei and David’s special guard did not join Adonijah. King David is nearing death. David has many children from a handful of wives and a number of concubines. David’s hold on the throne has alway been precarious. He had to unite the divided tribes of Israel to claim Saul’s throne, yet an undercurrent of political discontent among the tribes simmers just below the surface. 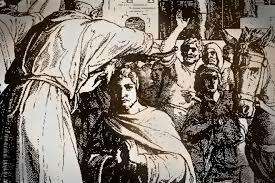 Just years before the events of today’s chapter, David’s own son, Absalom, had committed fratricide and attempted a coup de tat. He was nearly successful. The weaker David becomes in his old age, the more intrigue grows regarding the future of the throne and the kingdom. Adonijah is the eldest living son. By tradition, the throne should be his. But, that adulterous woman, Bathsheba, and her son Solomon appear to be daddy’s favorites. Word has it that David has promised the throne to Solomon. It’s not fair. Solomon is only a kid. Adonijah has been waiting for years expecting he would be king. All the power and riches should be his, and he feels his chances slipping away. So, Adonijah takes matters into his own hands and decides to strike while the iron is hot. He needs powerful men on his side. He gets two of dad’s inner circle, General Joab and the powerful priest Abiathar, to lend him their support. If he can get the military and the religious leaders on his side, this coup might work. There was a fatal flaw in Adonijah’s plan. Joab and Abiathar were powerful men, but they were not part of the kings inner circle, and David was not dead. Adonijah pulled the trigger too soon. His father, the king, still had strength and voice to speak clearly regarding his will. Nathan the prophet, the equally powerful priest Zadok, and David’s elite military guard, held sway in the king’s chambers. Together with Bathsheba they convinced David that he must appoint his choice, Solomon, to the throne or risk another bloody coup that could rip the nation apart. This morning I am fascinated by the complexities and political intrigue surrounding the palace and the throne room. History is filled with compelling stories of people who plotted and connived for various thrones and positions of power. I love these stories because times change and circumstances change, but the human element remains universal. I see in the story of Adonijah the shadows of people I have witnessed scheming for positions of power in business and churches. Making the right friends, relational alliances, family dynamics, and power grabs are as much a part of political, familial, corporate, and organizational systems today as they were in the palace of Jerusalem thousands of years ago. I want to accomplish God’s purposes for me. I want to be wise in my relationships and my dealings. I want to obey Jesus’ command to be both shrewd and gentle. Yet, I hope that I never put my personal want of God’s desire and will for me. One of the most frustrating things for me as a listener is when a speaker blathers on, his or her message chasing off on various tangents without ever clearly saying anything. I learned long ago that when preparing what I need to say, no matter the context of the message, I should always nail down “the one thing.” Think of “the one thing” as the entire message boiled down into a simple tweet on twitter. It is “the one thing” I want my listeners to hear clearly. It is “the one thing” I am really trying to say. 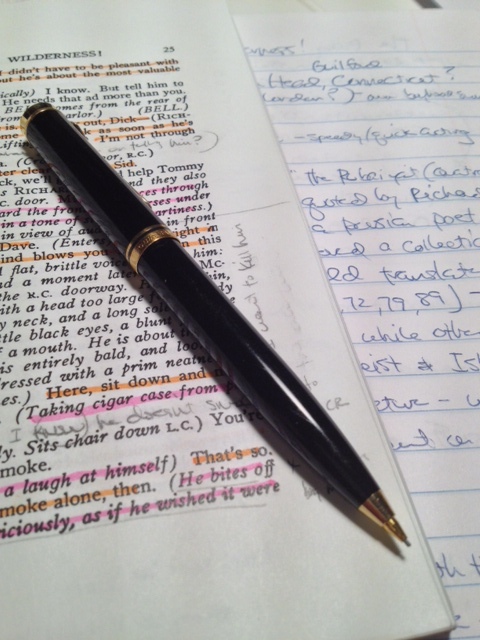 It serves me well as I prepare my message because I can constantly review my points, my stories, and my illustrations with “the one thing” in mind. If something doesn’t directly connect my listener to “the one thing,” or if they have to connect multiple dots in order to arrive at “the one thing,” then it shouldn’t be in my presentation. Life is full of words, posts, tweets, texts, videos, and podcasts. We are inundated with a steady stream of messages. I wonder if it’s making us better communicators or if the one thing is constantly lost in the blather. U is for Union Street Players, where Wendy and I have serving both off and on the stage for over a decade. I was just elected to my tenth consecutive terms as USP Board President (no one else wants the job), and Wendy has faithfully served as Treasurer for most of that time, and as a Board member for longer than me. 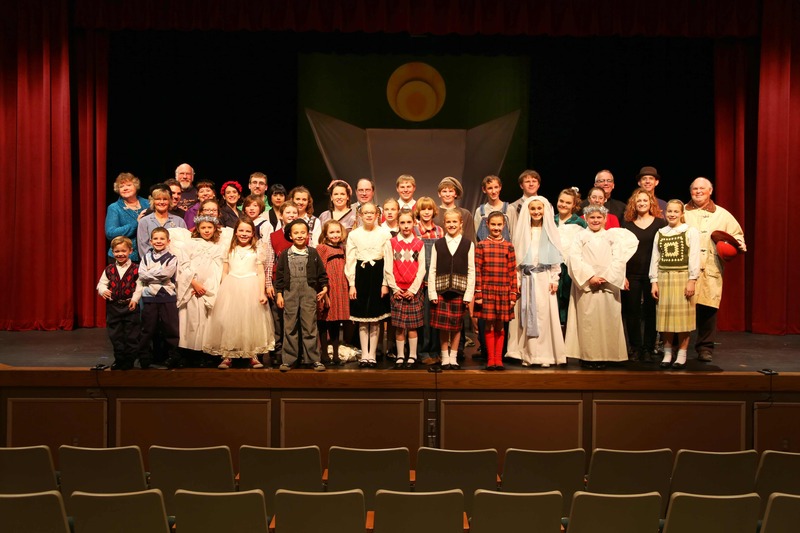 Pictured here is the cast photo of last year’s Best Christmas Pageant Ever, which I directed. The weather over the past two weeks, and the forecast going into next week, have been picture perfect here in Iowa. After a long stretch of what seemed to be endless rain, the rain has departed and given way to sunshine. It has, indeed, pleased these eyes to see them and my entire spirit feels a bit of a lift. I’ve mentioned in previous posts that life has been full of transition for the VWs. Both Taylor and Madison have launched on new stretches of their own respective paths, and have been experiencing both the anxieties and thrills that a new road can bring. Suzanna has transitioned from full-time student to full-time work as she runs between three part-time jobs. Wendy and I, of course, are transitioning from one house to another along with other shifts in life. As I read through Ecclesiastes, I have been received a much needed reminder of life’s big picture. Rain eventually gives way to sunshine. There will be dark times along the way, but light is sweet when eucatastrophe breaks through the darkness. Life has been filled with the anxiety and uncertainty of transitions, but like the rain clouds departing it will eventually give way to more peaceful, stable places. Our jobs are to keep pressing on.